The early apple season is full of apples that are pretty tart. The exception to that may be the Paula Red. Paula Red apples come out in August and are among some of the first apples you find at the farmers market. It’s a mainly red apple with some areas of green/yellow. The skin is shiny. It’s a nice apple to take a picture of. Paula Reds were first discovered in Kent County, Michigan in Sparta Township. It is a very popular August apple in Michigan. 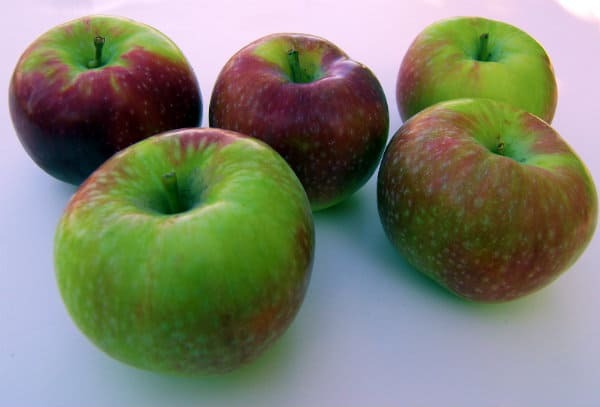 A grower by the name of Lewis Arends discovered them in an area of his orchard that contained McIntosh apples. It’s exact parents are not known but it would make sense for one of them to be a McIntosh (Cortlands have been rumored to be the othe parents). Some people mistake the Paula Red for a McIntosh. They are similar in appearance and flavor. Lewis named the apple after his wife, Pauline. Paula Reds first hit the market in 1968. Overall Feeling: Paula Red start out as a crisp tart apple and sweetened up as they age. They become more balanced tasting after a week. But the downside is that they become soft and mealy quickly. 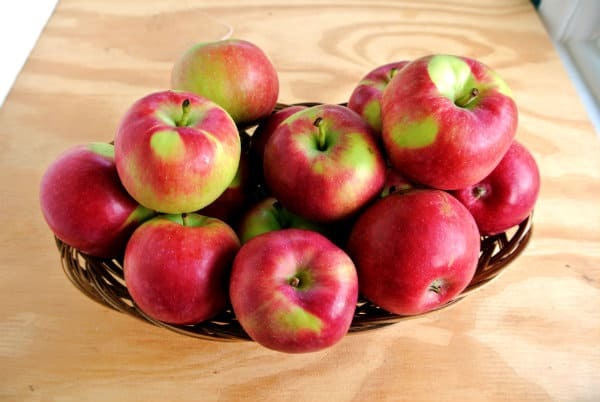 Use them as a tart fresh eating apple first and then you can use them to make applesauce if they get too soft for your liking. I do think the flavor is better with age but then again if you need a crisp apple to be satisfied you won’t appreciate any flavor improvements.